Carol Mertz » Shark Attack! Shark Attack! is a wearable alternative controller game for three players. The game functions in two phases: Swim phase and Attack phase. During swim phase, players must all make “swimming” motions with their shark hand, while placing their second hand firmly on the table. After a randomized interval, the game switches into Attack phase, during which an LED light strip and the LED eyes of one player’s shark glow red, indicating that they are the hungry shark. That player, while keeping their second hand on the table, must use their shark to bite another player’s shark. If they successfully attack, they score a point, indicated by the LED strip. The game continues to switch between Swim phase and Attack phase until one player reaches five attacks. Our team’s goal was to create a multiplayer experience that encourages players to be silly and creative. 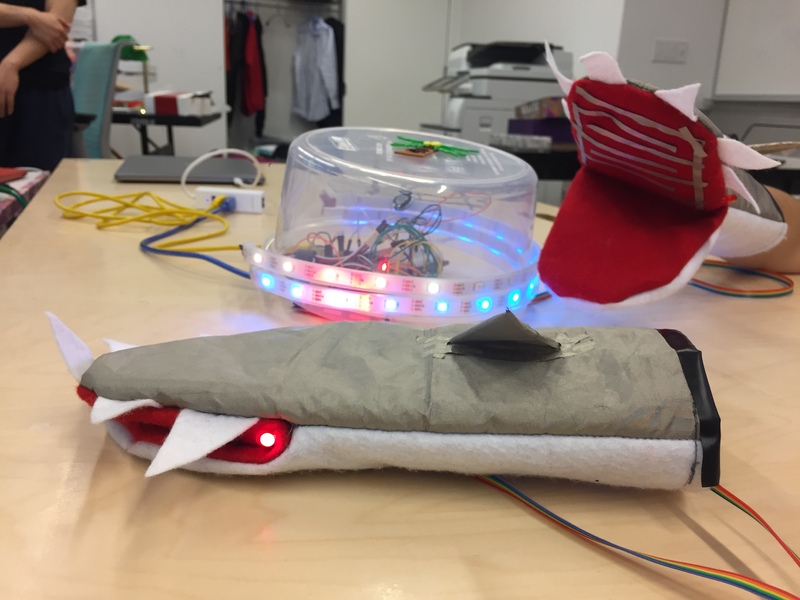 Shark Attack uses three custom-created shark gloves, wired with simple sensors. 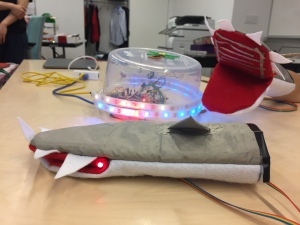 A tilt switch tracks how long each shark has been “swimming,” while a simple digital switch made of capacitive tape determines whether a bite has successfully landed on another shark. The added rule of keeping one hand on the table keeps players all arm’s reach of one another, and prevents the gloves’ cables from pulling from the equipment in the center. Shark Attack! was created with Francesca Carletto-Leon, Zongheng Wang, and Chris Hovey for the NYU Game Center’s Beyond The Joystick course exploring alternative controllers. Thanks to Kaho Abe for her education and guidance during the project. Also thanks to Brendan Byrne for his hot soldering tips.